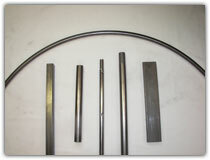 "Metal Tubing Cut To Size"
We have two Eagle Bending Machines for arcs and large radius bends for round, square & rectangle tubing. We have Hand DI-Arco bending capabilities. D&W Mfg. Co. uses pines T-3 press bending machines to bend tube vertically. This operation will crush bend the radius sizes that can be bent. Range from 1/2" OD to 1 1/4" OD and from 20 GA to 14 GA. 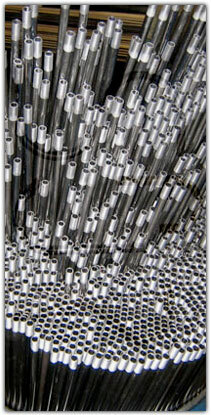 Round and square tubes can be bent horizontally over a mandrel to create a smooth, cosmetic appearance along the bend. Black iron pipe for lighting fixtures can also be bent horizontally.